Plaka is known to the locals as the “Neighborhood of the Gods” as it sits on the northeast slope of the Acropolis, the ancient citadel of Athens. Filled with quaint cafes, spectacular views, and ancient archaeological sites, Plaka has become a must-see Grecian destination. If you’re passing through Plaka this summer, discover how you can take advantage of the day! From The Museum of Musical Instruments to the Hellenic Children’s Museum on Kydathineon, there’s something for every traveler in Plaka! The Ancient Agora includes a cluster of buildings such as the Vouleftirion and the Tholos, where Greek leaders would meet to discuss political matters. The reconstructed Attalus Stoa operates as a museum. The collection includes clay, bronze, and glass sculptures dating back to the 5th century BC. Built by Lysicrates in circa 335 BC, the Monument is located on central Tripodon street in Plaka. Travelers can view the Lysicrates Monument for free from the street or from a nearby restaurant or cafe. This large marble tower was built by the astronomer Andronikos Kyrrestos in the 1st century BC. It was originally created as a meteorological station but was later used as a church in the first Christian years. Whether you’re seeking the finest fair in Plaka or you’re sightseeing on a budget, there’s a place to dine for every traveler. Head to Platanos for traditional Greek tavern food, or take a seat at Avacado for refreshing vegetarian cuisine. Stop at one of Plaka’s many cafes, such as Yiasemi, where friendly neighborhood cats run free through the lush gardens surrounding the tables. When wandering down Plaka, stop to admire the many souvenirs and gifts in the many shops! 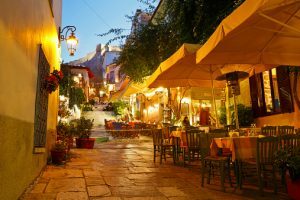 Plaka offers some of the trendiest, most fashionable shopping in Greece. From handmade jewelry to vintage clothing, it’s doubtful that you’ll leave the cobblestone streets of Plaka empty handed! AESU offers several trips to Greece, including Cosmopolitan, Explorer, Euro Focus, and Great Escape. Explore Greece and its interesting culture, plus experience some of the greatest food and wine in the country! If you have any questions or want help booking your Grecian adventure, please contact AESU by calling 800-638-7640, or fill out the contact form found on our website. This entry was posted on Wednesday, July 5th, 2017	at 11:19 am	. You can follow any responses to this entry through the RSS 2.0	feed. Responses are currently closed, but you can trackback from your own site.